I can’t believe how fast the last few months have flown by! It almost makes me sad knowing how fast Thanksgiving and Christmas will pass:( At our house we start working on Christmas themes a week before Thanksgiving. 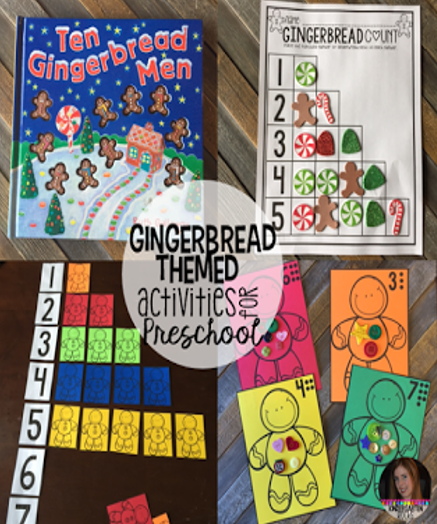 Children LOVE gingerbread men (what’s not to love about a talking cookie) and it is so easy to use gingerbread men to teach multiple concepts and the kids just eat it all up (:)). Below are a bunch of ideas that I enjoy using at my home with my children and what I used in 4K! Prior to starting a big unit I like to involve parents. 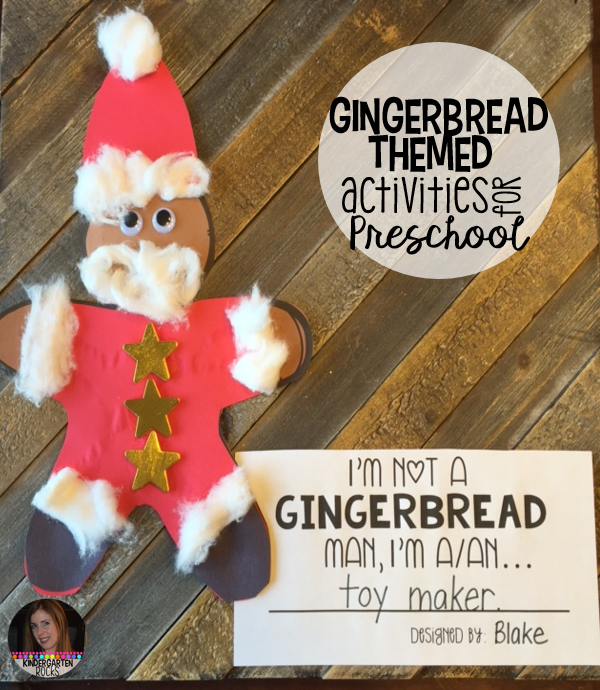 “I’m Not a Gingerbread Man” is similar to “I’m not a Turkey.” The boys and girls will take this activity home and complete it with their parents. 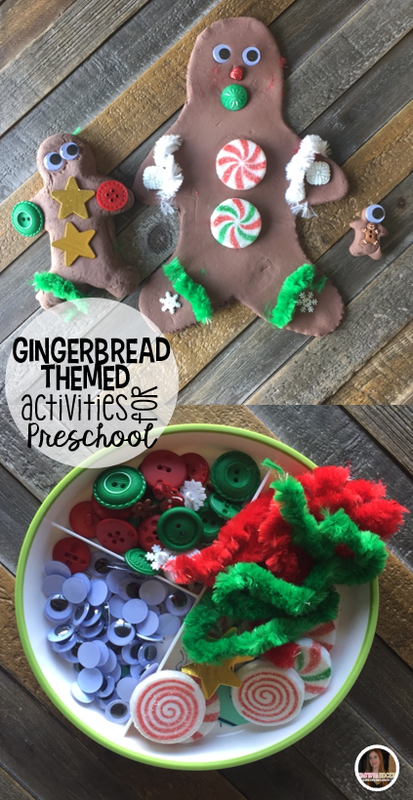 As a parent, I love getting activities to do with my children from school. It gives me a chance to talk to to them about the concept. I know that they go to school excited to share whatever we make. My daughter loved this activity and wanted her gingerbread man to look like Santa. 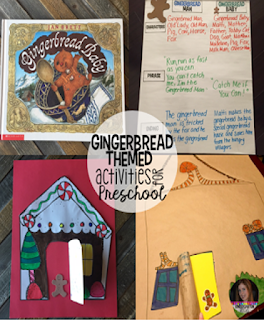 To start our week we read the book The Gingerbread Man by Gail Yerrill. I like this version, because there are not as many characters and the illustrations are amazing. We worked on predicting with a quick little survey. No matter the age I think it is important to work on book handling skills. We are always looking at the characters, parts of the story, problems and solutions. At least once a week I like to do an activity that builds on comprehension. 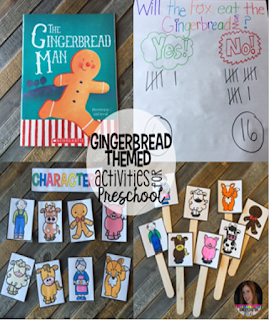 Story puppets are an easy fun way. At home Violet and I continue to build on story comprehension with this fun character bowling game. I taped the picture cards to to the bowling pins. 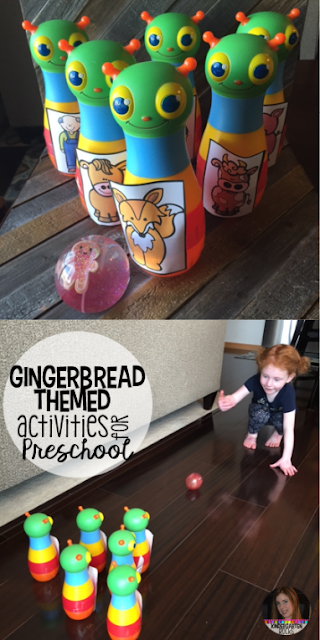 Violet used a cute ball I found at target with a gingerbread man to blow over the characters. She had a blast with this! We continued to discuss the characters with this simple sensory table. 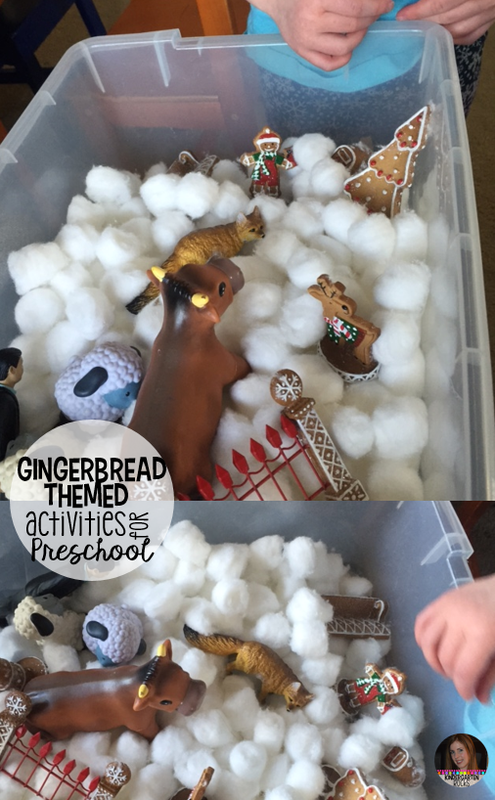 I placed cotton balls in a shallow storage bucket, along with a fix, cow horse, pig, old lady and man and cute gingerbread figures I found at Hobby Lobby. She continued to act out the book. Next we read Gingerbread Baby, by Jan Brett. This is my favorite gingerbread book of all time, and my daughter loved it. 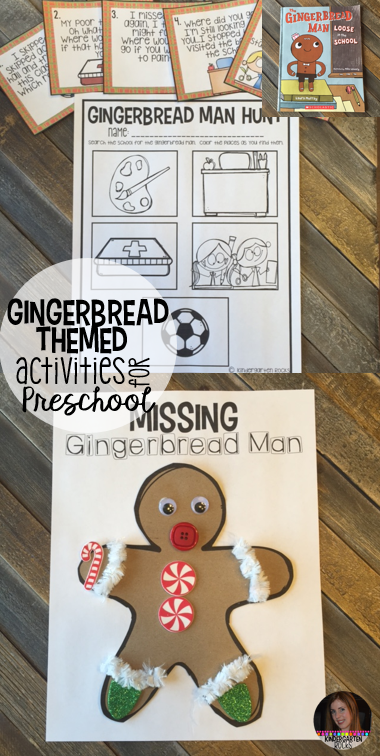 We compared Gingerbread Baby to The gingerbread Man. We looked at the characters, repeating phrase and ending. I love creating the gingerbread house for the gingerbread baby. My seven-year-old even wanted to create a house. We used smelly markers and brown mail wrapping paper from the dollar tree to create our giant houses. Violet also wanted to create a little house using the printable above. I try to tie as many concepts as possible into our units. Violet has really been interested in numbers, shapes and colors the past few months, so that is where our focus has been. 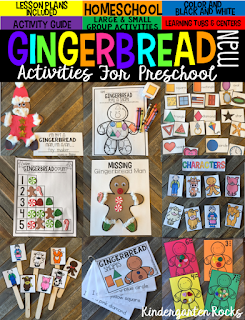 I created Gingerbread Shapes book for her. It is a cute repetitive book that she can read in her book area. We tried to do a shape hunt around our house, however, she really didn’t understand what we were looking for…so I created this simple sorting game. She had to sort the pictures by shapes. Violet loves to search the house in fun game-like activities. She loved searching the house for shapes. 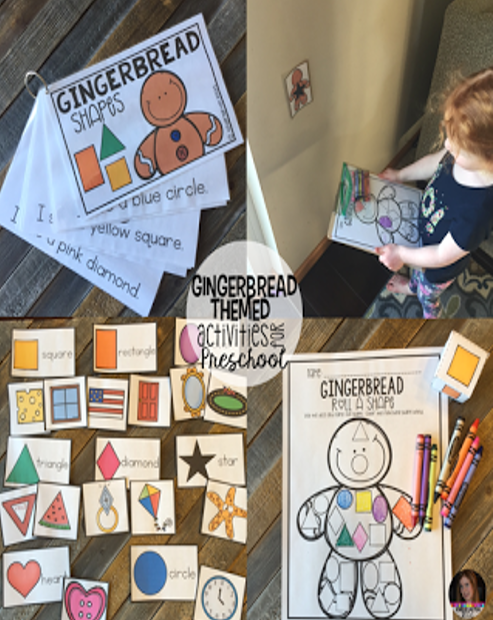 Once she found the shapes on the gingerbread men she colored it in. We also rolled a dice, identified the shape and colored the shape on our gingerbread man. 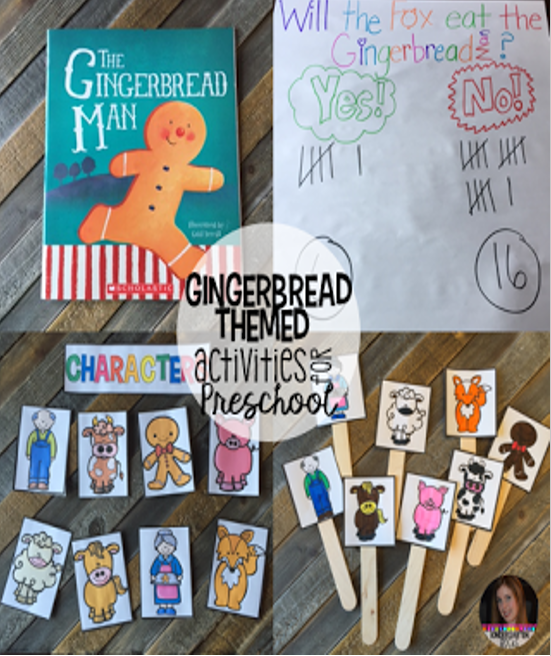 On Thursday we read Ten Little Gingerbread Men by Ruth Galloway. We loved counting and it was fun to count the raised little gingerbread men. We guessed how many would be left at the end of each page. 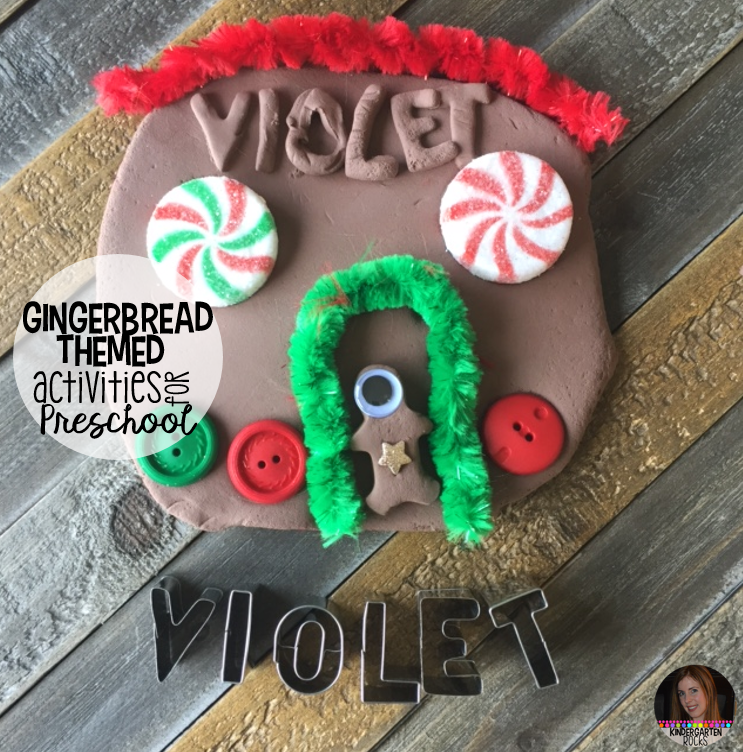 Next, I placed 50 gingerbread men on a parachute and Violet and her friends shook the parachute and watched the men fly all over the house. As we shook the parachute we said the phrase, “Run run as fast as you can can, you can’t catch me I’m the gingerbread men.” The boys and girls counted the gingerbread as they picked them. 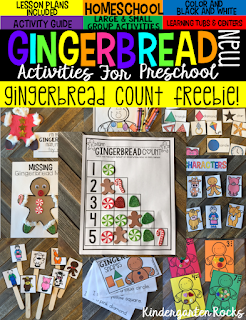 We worked on 1 to 1 correspondence and matching numbers to sets by placing the matching number of gingerbread by each number. 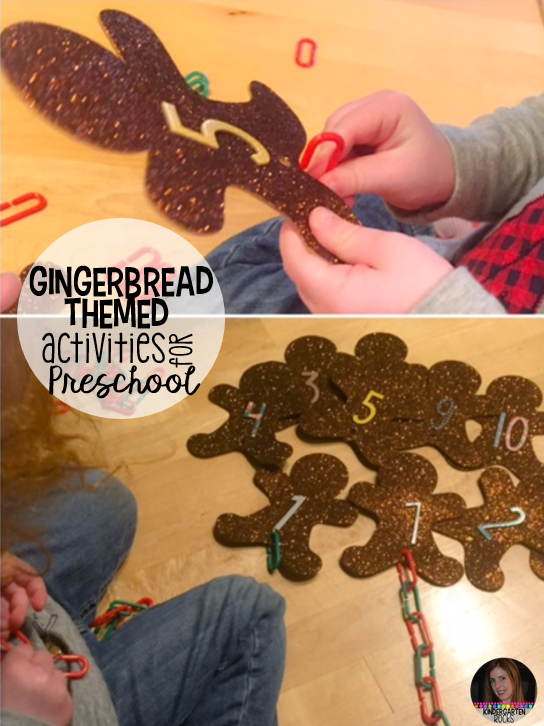 We continued with a cute 1 to 1 correspondence worksheet, where the kids put stickers in the boxes by each number and placed the matching number of buttons on each gingerbread man. 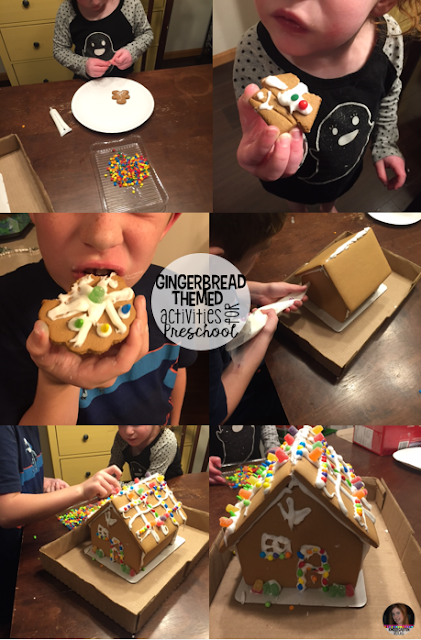 To end our week we decorated a gingerbread house and cookies. They did pretty well on it on their own. We build the base of the house and let it set overnight, added the roof in the morning. We were able to decorate it after dinner that night and the 7 and 3 year-old were pretty independent. I lucked out this year and scored a set of gingerbread men at Michael’s Craft Store. They came in a set of three: small, medium and large. So we used them to create art. Violet dipped them in paint and we discussed and compared the gingerbread men. We also used the gingerbread men to create playdough gingerbread men. They turned out really cute, the little guys all looked like minion gingerbread men. I had a bunch of random things around the house and placed them on a little dinner plate. Working with playdough was such a hit that we built gingerbread houses and put the letters of our name at the top. 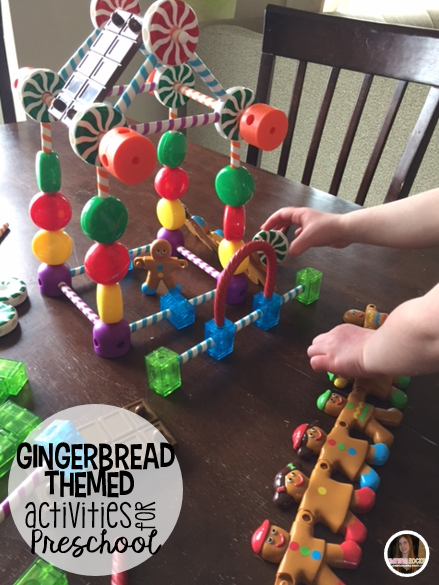 One of our favorite activities was the gingerbread snapits and candy building blocks I purchased on Amazon. By far my favorite activity of the week was our gingerbread stockings. We have been working hard on the letters in our name and letter order. To start, I bought the stockings at the Dollar Tree. Then, I purchased the stuffed gingerbread men and letters at Hobby Lobby. 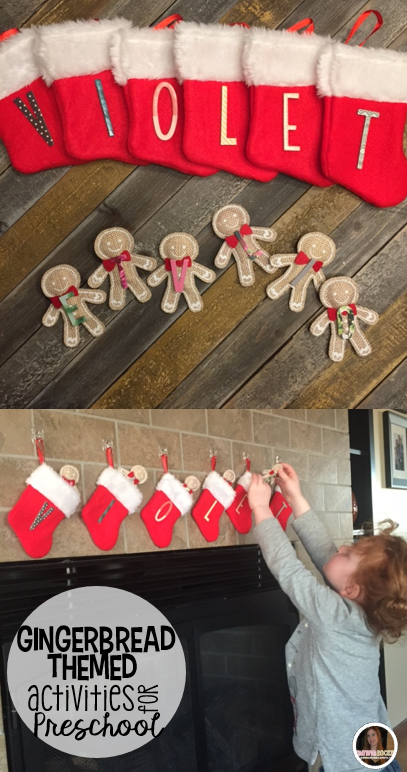 I hot glue the letters to the stockings and gingerbread men. I placed 3M hooks above the fire place and hung the stockings. 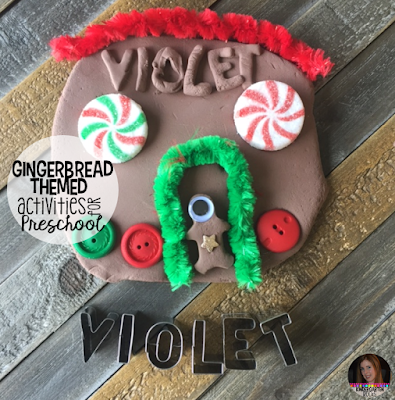 Violet loved matching the letters and placing the gingerbread men inside. I also hid the gingerbread men around the house and she had to find them and place them in the matching stocking. These were such a hit that we moved the stockings into her bedroom to play. Another one of our homemade activities was this cute little gingerbread guy. I bought the foam gingerbread men at a craft store and placed number stickers in place of buttons. I used a paper punch to punch a hole under the number. She used linking chains and placed the matching number of links under each number. 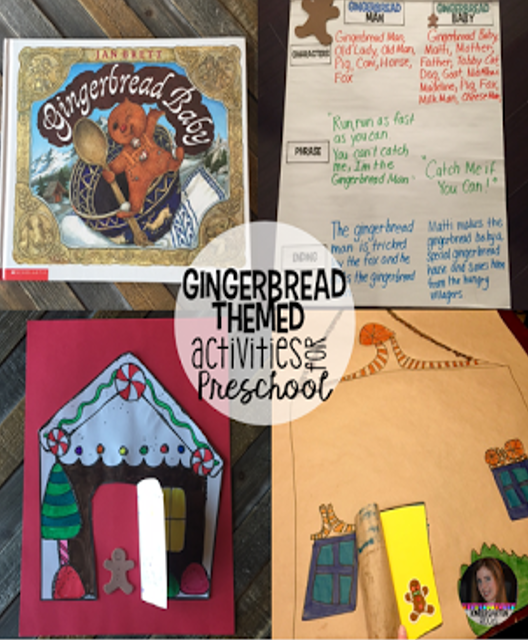 I hope that I was able to give you a few ideas for your gingerbread unit! 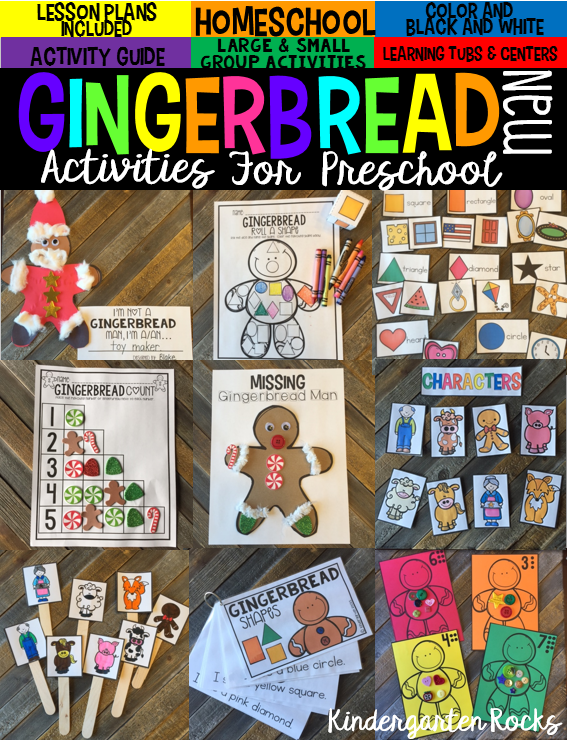 You can find all of the printables in the unit below. Click (here) to check it out! 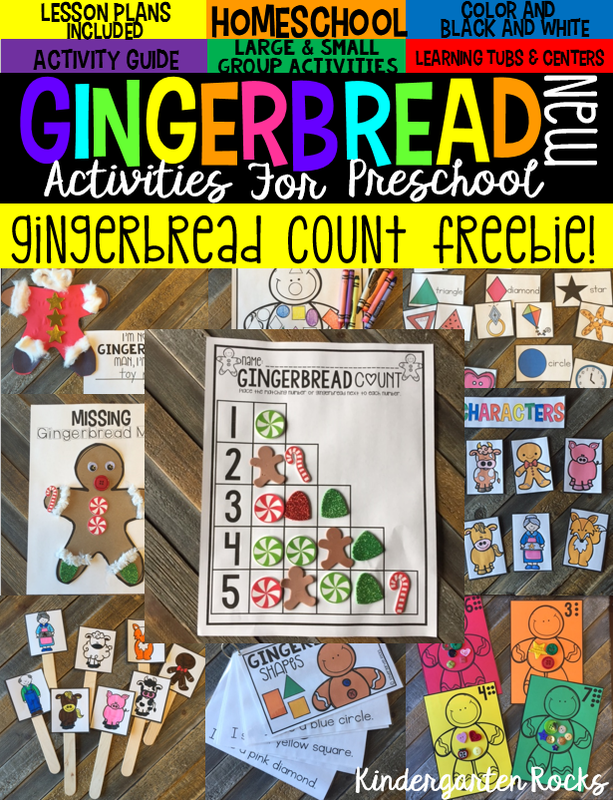 I have also included a Gingerbread freebie as well. Click (here) to download.